Following a successful Kickstarter campaign this summer a new professional magazine of speculative fiction was born, Uncanny: A Magazine of Science Fiction and Fantasy. Founded and edited by three-time Hugo Award winner Lynne M. Thomas and three-time Hugo Award nominee Michael Damian Thomas Uncanny Magazine wishes to showcase in each issue new and classic speculative fiction, fiction podcasts, poetry, essays, art and interviews. Each issue will contain at least 4-6 new short stories, 2 reprinted stories, 2 poems, 2 non-fiction essays and 2 interviews, written by award-winning contributors and emerging new talents, with a clear aim towards “intricate, experimental stories and poems with verve and imagination that elicit strong emotions and challenge beliefs from writers from every conceivable background. Uncanny believes there’s still plenty of room in the genre for tales that make you feel.” Uncanny Magazine’s issues will be published in electronic formats bimonthly and will be available on all major online ebook stores, but also for free online, with the first half of each issue available on the magazine’s website from the second Tuesday of the respective issue’s first month and the second half a month after that. The first issue, November/December 2014, comes with very interesting content and a wonderful cover art by Galen Dara and it will be available next Tuesday in ebook version and released for free online in two stages, the first half on the day of the ebook version release and the second half in December. 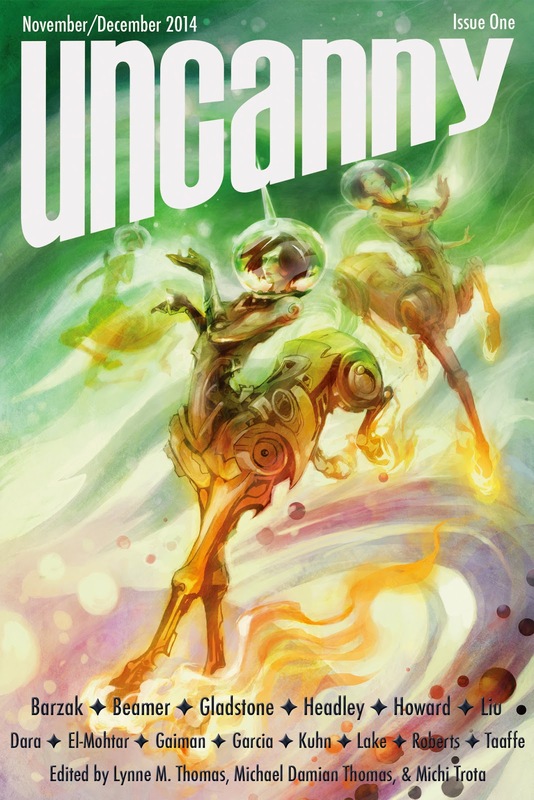 I wish Uncanny Magazine all the best and hopefully it would soon become one of the favorite places to visit by the fans of speculative fiction!